Smooth, glossy lips kissed with the luxurious conditioning of Vitamin E.
Blended with Sunscreen and Olive Extracts for a creamy coat of lush color. 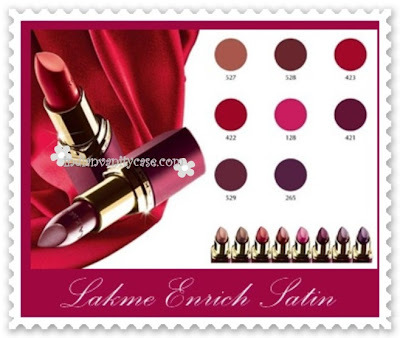 Available in 8 sumptuous shades developed especially for Indian skin tones. 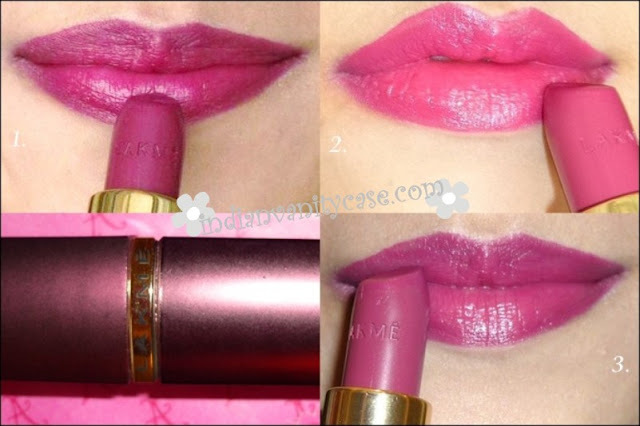 Texture ~ Smooth, long lasting, highly pigmented and does not dry up my lips at all. I hate to admit it, but this lipstick has impressed me to the core. My intention was to buy it, review and then give it away to somebody, but now I want to keep it for myself because it has managed to soften my 'change-of-season' chapped lips, which my other lip balms have failed to do recently. It could double up as a lip tint too when dabbed on lightly and blended with fingers. Scent ~ It has that unmistakable classic lipstick scent, like the lipstick my mom had at a time when all I cared about was fairytales. But it doesn't bother me because it is not very strong. Packaging ~ Encased in a cute burgundy-colored satin-look tube with a gold upper end, it looks quite classy. Price ~ Reasonably priced at Rs.225. Buy again? Very unlikely. I think this lipstick is like a fling ~ good while it lasts, but when it's over, it's over. Time to look for true love....or another fling. Unless, they offer more shades - lighter, fresher, summer shades. With matching tubes. Can't help imagining a salmon pink lipstick in a matching salmon pink-colored tube. Now that is true love material. hey, that colour packs in quite a bit of punch! did the lipstick taste of anything? oh thats good because i bought one enrich lipstick and it tasted funky. by the way, 255 is quite a competitive price. oh and i sent you an email, hope you got it. Oh ya Rima...I just replied to it. The colour looks lovely on you. I am glad it does not taste anything. But I am reluctant to buy these. And I so like that twitter bird once again. :P lol!! @Rati~ LOL ;D. Actually I was reluctant too. But when I was at the counter I wanted to buy it ;P.
Haha...Cynthia, I love how you described it as a fling! ;) What a great review! Good review Cynth..But I am totally off Lakme now. Probably I would buy only one product from them-jewel sindoor and that too coz Rati had given a good review.. But this lipstick really looks superb on you sweetie. BTW I really like the new look of the site - very clean and non-fussy. Pretty! @Tanveer ~ Ya it's quite cheap..that's y I bought it ;D n Thank u! I agree, the packaging looks so sophisticated. Pretty shades too.